Many Internet users are confused with the two similar terms 'Internet browsing history' and 'Google search history'. Though both terms look similar, they are different. 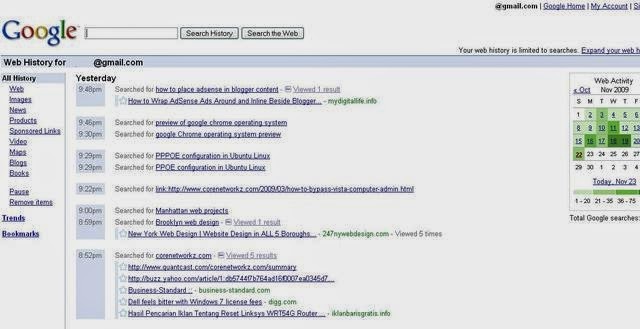 Browsing history is saved on your web browser and can be viewed by pressing [Ctrl] and [H] buttons together. This key combination varies with browsers. Google Search history is the record of searches you have made while you are logged in your Google account. Internet browsing history will be deleted by clearing the saved history on your browser but Google search history will remain. There is a different procedure to remove it from your account. To see and delete Google search history, you need to log on to your Google account. Here you can see how to remove all previous log details and start from a clean slate. To see it for a particular account, follow the steps below. Sometimes you may be prompted to re-login to your account to see this page. This page is well organized and you can view the Search history of all times. It will definitely influence Google Personalized Search feature. If you don't know this feature, visit the link below. If you do not like it affects the search results, it is better to delete it from your account. Below section explains how to do it. Now check the items you need to remove and press the Remove button. Now entire stored data will be successfully removed from your account. Now onwards you will get a fresh start without any influence. If you belong to the group of people who don't like to left the remnants of their previous activities on their laptops, the procedure I explained in this tutorial is for you. By following the steps explained in this article, you can remove the log details of your activities stored in big G's server. However, it doesn't guarantee your safety from log details stored on the server side by big G. All you can ensure is if someone hacks into your profile, he will never get the traces of your prior web activities. Now let us check some of our popular tutorials.